Kennedy's O Albany! is in part the non-fictional stories he covered in his novels, Legs and Billy Phelan's Greatest Game. 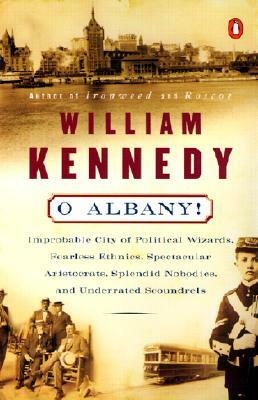 Kennedy retells the exploits of the bootlegger Jack 'Legs' Diamond, the bungled 1933 kidnapping of John O'Connell, Jr., heir to the Albany Democratic machine and explores the Albany of his past, including its demographics and vanished neighborhoods. Kennedy is a professor in the English department at the State University of New York at Albany. He is the founding director of the New York State Writers Institute and, in 1993, was elected to the American Academy of Arts and Letters. He has received numerous literary awards, including the Literary Lions Award from the New York Public Library, a National Endowment for the Arts Fellowship, and a Governor’s Arts Award. Kennedy was also named Commander of the Order of Arts and Letters in France and a member of the board of directors of the New York State Council for the Humanities.